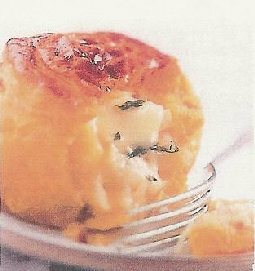 This is a much-complimented French recipe that encases a whole Rocamadour goat's cheese in puff pastry, impressive but quite simple to make. The walnuts and sage are my own additions. 1. Peel potato and cut into small cubes. Put them into a pan and add a half-glass of water and simmer until cooked (or steam them until soft). 2. Peel onion and chop finely, or finely slice spring onions. 4. Unroll the pastry and use to line 4 well-buttered ramekin dishes, leaving the edges slightly over the top edge of the dishes. 5. Into the pastry cases, put some of the cooked potato cubes, salt & pepper, a sprinkling of chopped sage, a few chopped walnuts, the chopped onion and finally a whole Rocamadour cheese. Brush the top edge of the pastry with egg yolk then cut a pastry disc the same size as the ramekin and press it on top of the cheese, sealing the edges of the pastry. Trim round the ramekin with a knife. Brush the pastry lid with egg yolk. 6. Cook in the oven for 30 minutes until the top is brown. You should be able to prise the pies out of the ramekins to serve, if not then serve in the dishes.